The measured Q-function for a weak coherent state. The latest paper from my lab at Pacific appears this week in Physical Review A. Multimode quantum state tomography using unbalanced array detection describes a technique we have developed to measure the quantum state of multiple optical modes simultaneously. We are currently working to apply this technique to slow and stored light systems where it will help us characterize the fidelity of optical memory devices. Abstract — We measure the joint Q function of a multispatial-mode field using a charge-coupled device array detector in an unbalanced heterodyne configuration. The intensity pattern formed by interference between a weak signal field and a strong local oscillator is resolved using Fourier analysis and used to reconstruct quadrature amplitude statistics for 22 spatial modes simultaneously. The local oscillator and signal propagate at an angle of 12 mrad, thus shifting the classical noise to modes that do not overlap with the signal. In this configuration, balanced detection is not necessary. 420 nm light passes through a diffraction grating after being generated by pumping rubidium vapor with 780 nm and 776 nm light. The pump beam appears very dim near the second order diffraction beam. The first paper from the Photonics and Quantum Optics Lab at Pacific University appeared today in the American Journal of Physics: Collimated blue light generation in rubidium vapor and [PDF]. Congratulations to my student coauthors and our collaborators at the University of Portland! This is a fairly straightforward experiment to set up if you already do saturated absorption or other rubidium vapor labs anywhere in your curriculum. We used two external cavity diode lasers (780 nm and 776 nm), a warm rubidium vapor cell, and some additional standard optics. A 420 nm bandpass filter is handy, but not necessary for viewing the generated light. The results are pretty cool to see, and they illustrate frequency conversion in nonlinear optics. With a (barely visible) near-IR beam going into the vapor cell, you see a bright blue/UV beam coming out… it’s almost magic when you see it for the first time. Of course the power in the blue beam is much lower than in the NIR beam, but we are more sensitive to blue so it looks quite bright. 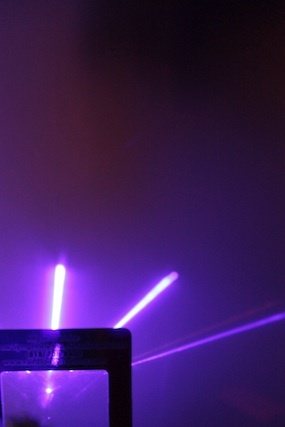 The photo shown here was taken with an open shutter while I swept a piece of paper along the beam. The camera has an internal IR filter which does artificially dim the IR beam. This isn’t too far off from the correct appearance. I have been working on a Schlieren Imaging setup for demonstrations and discovered an easy way to project the image onto a viewing screen. For reference, the mirror I used is a 1.5 m focal length mirror, 6″ diameter. Other parts are a simple LED flashlight and a 2 mm aperture. I don’t remember why I looked this up, but the way a halogen lamp works is rather fascinating. The halogen gas (hence the name) surrounds a tungsten filament. Unlike a standard tungsten filament in vacuum, the halogen environment sets up a chemical reaction that essentially recycles the tungsten atoms that leave the filament. In a regular bulb, those atoms would stick to the globe of the bulb and never be used again. In a halogen bulb, they make their way back to the filament (but not necessarily where they started). Ultimately this makes the filament last longer, and also keeps the glass very clear since there isn’t a steady accumulation of tungsten atoms on the inside surface. 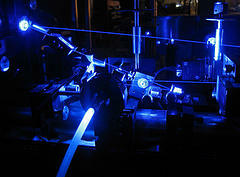 We’ve been using the Dichroic Atomic Vapor Laser Lock (DAVLL) system for laser stabilization in our lab. After getting tired of our first version of a solenoid coil, I turned my summer students loose designing a new one. Not only is the version vastly better, but it’s made in-house on our own 3D printer. I’m proud to say it was recently featured on Thingiverse as thing 25902. Way to go Noah! If you want to hack on it, the original is available on tinkercad. I gave my final in Electronics on Tuesday (Dec. 15), and it went so well, I can’t stop thinking about it. The format was something I haven’t tried before: 1.5 hours of written test (individual) and 1 hour of group problem solving. The problem they had to solve was to construct a laser tripwire alarm. There are seven students in the class, so putting them all in one big group is feasible, but I was worried about students not participating or being pushed out of the project by other students. It turns out that I had nothing to worry about, they delegated and divided perfectly, coming back together to get over some hurdles and then breaking apart again to complete their roles. They passed with 12 minutes to spare, and even left it set up as a demo at their project showcase party. My only hope is that future classes work together as well as this group did. Posted on February 14, 2008 by AMCDawes Tagged facultyjob searchopticsphysics	Comments2 Comments on Job Search: he shoots, he scores! Job Search: he shoots, he scores! Well you may have noticed a lack of new posts for a few weeks. Chalk it up to me entering the initial thesis-writing phase, combined with job applications, interviews, and the general associated chaos. The good news, of course, is that the job search process has gone well. After two enjoyable interviews, I have received my first offer (let’s say it’s from from Liberal Arts College A). I’m trying to find out as much as I can from Liberal Arts College B before too long, in order to make the decision as informed as possible. This is the funny gray area that everyone always talks about. I have been leaning towards A, and I’m very excited to have an offer from them… but it a lot of ways it’s like “deal or no deal”… I wonder what is in case B.